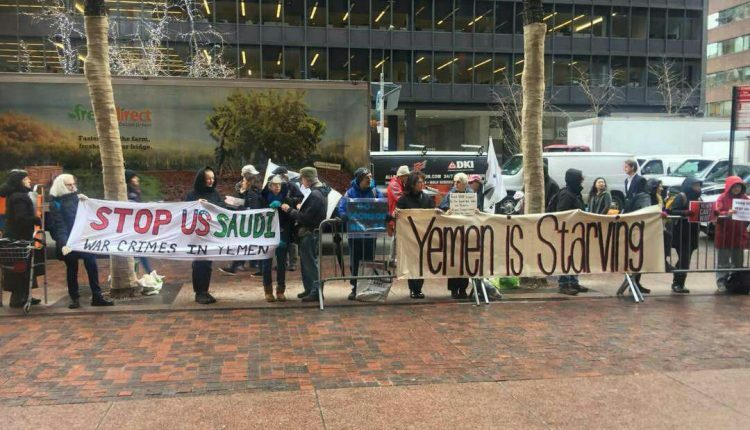 Dozens of Yemeni and foreign activists at New York University, one of the largest universities in the United States, on Tuesday have organized a solidarity stand with the Yemeni people, demanding a halt to the Saudi-led war and blockade on Yemen. The participants in the stand raised banners and slogans calling for the cessation of crimes committed by the coalition in Yemen, and stop the shelling, torture and starvation being exercised against Yemenis. This event will be the beginning of several events at universities and the residences of members of the US Parliament, the participants said. Last week, Human Rights Activists organized a protest rally in front of the headquarters of Shank Schumer, the majority leader of the Democratic Party in central Washington, to demand a halt to war crimes committed by the coalition in Yemen. The protesters raised banners expressing their demands to protect Yemen’s children from war. As well as hundreds of Iraqis have staged a protest in central Baghdad against Saudi Arabia’s war on Yemen. Participants called for the lifting of the blockade on Yemen and expressed solidarity with Yemenis.